Despite seeing Banbury Bulls score plenty of points, head of coaching James Kerr wants them to be tighter in possession. Looking back on Saturday’s Wadworth 6X South West One East vistory at Stratford Upon Avon, Kerr said: “It’s really pleasing, to come away to a rival like Stratford and to score that many points it’s really good. But I told the boys after the game we lacked a bit of possession, when he had ball in hand. “We scored points which is great, however, when we come up in other tighter games, we need to be happier with the ball and retaining it for longer. Fair play to Stratford we gave them so much possession and they scored some good tries against us. Bulls were far more clinical than Stratford when they had the ball. Duncan Leese scored two tries but it was his efforts in defence that stood out. 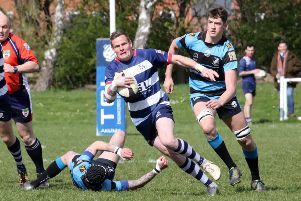 His individual tackle count provided turnovers at crucial times and he was Banbury’s stand-out player. Kerr added: “There were a lot of good performances. Both centres, Jack Briggs and Duncan Leese defended really well. However, I felt Duncan edged it slightly attacking.